I forgot to say, my lovely mother-in-law also gave me this Monkees album, Pisces, Aquarius, Capricorn & Jones Ltd. She tells me that she bought it back in 1967 - as soon as the record came out. So cool! Did I ever tell you how much I love The Monkees? I love the Monkees! did you ever see their movie Head? So bizarre. Well, now I am so jealous !!! That is such a nice rare record, you are sooooooo lucky! Enjoy the muusic ! I love the song STEPPING STONE the best but they have so many good songs. Your album could be a collectors item, some of them old albums are worth a good price. Nice of you MIL to give it to you. wow that is awesome! 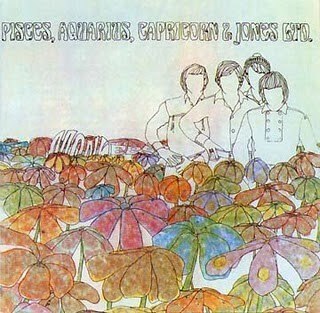 I love daydream believer, which one was the pisces though? Sadako - yes I've seen Head - bit of a head trip alright! Blue Home & Jann - don't think it'd be worth much as it's not in the best condition but it's valuable to me because of the family story attached. Amy - good question! I googled and Micky was Pisces, Peter - Aquarius, Mike and Davy are both Capricorn (and same birthday) so they put Jones on the end. Ally - yes I know. I read a couple of your Monkees posts but I didn't know you met Micky - he was my absolute favourite! I also preferred their earlier stuff but I still like some of their trippier stuff. We really do have a lot in common! Big fan of record covers from that era. Dang kids and their mp3s don't know what they're missin'.